How to Moving PrestaShop Installation to Different Folder? PrestaShop is versatile ecommerce software that is widely popular. The reason it is so popular is purely due to the innumerable features that come built into the PrestaShop installation. The basic installation of PrestaShop is very feature rich. 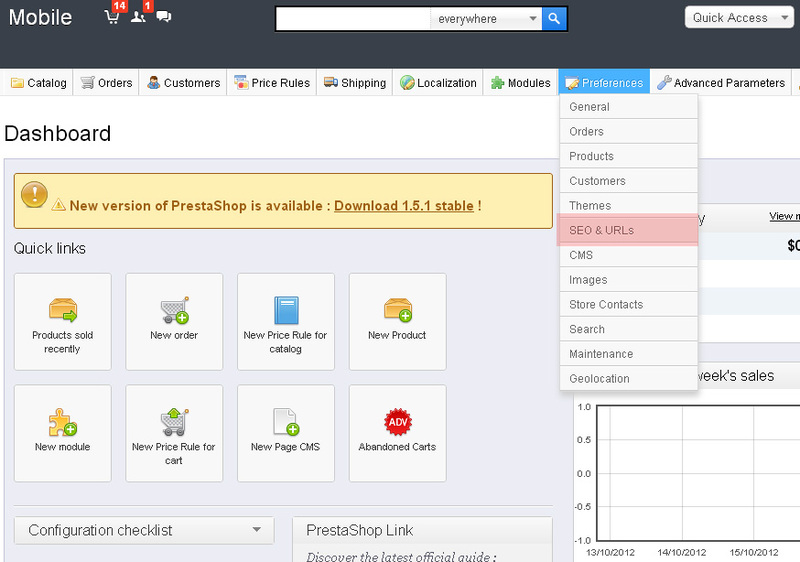 Besides which, the PrestaShop admin panel user interface is very intuitive and user friendly. This makes it easier even for the not so computer savvy people to quickly grasp the workings of the admin panel. Thus they are able to configure the website as per their requirements. PrestaShop has another good feature where you can add new modules if the ones you need are missing. In fact if you don’t find the module you are looking for then it is even possible for you to take help of a PrestaShop Web developer to do the job. Alakmalak is a company that provides such services and can help out for the installation and customization of modules and even add new functionality. Preferences -> SEO & URLsIt often happens that for some reason you require to shift your website to a different folder. For example if you have a shopping cart in PrestaShop and you now require a wordpress blog. The way this can be achieved is by either placing both the blog and PrestaShop in two different folders and having a common entry point. Alternatively you could even use the blog to link to the PrestaShop installation. Set Shop URLThere is one thing that you need to do prior to moving the PrestaShop file. You first need to login to the PrestaShop admin panel and select SEO & URLs from the Preferences menu. Here there is a special section called ‘Set Shop URL’. The URL of the PrestaShop needs to be changed here as per your requirement. Once you have saved the changes you can move all the PrestaShop files to a different folder via FTP or via a cPanel if provided. Feel free to contact our prestashop developer team today. Why Choose Alakmalak As a Your Growth Partner? Alakmalak is a web development company in India that offers services for several technologies. There have been around for a very long time and have developed over 2500 projects for clients all around the world. They have highly skilled web developers with a great deal of experience. How to Protect Images With A Watermark in Magento?